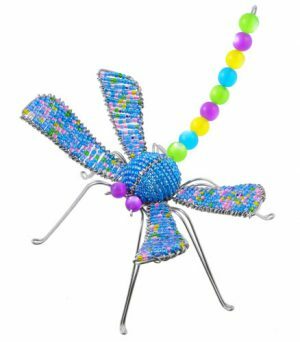 A WIREWORX beaded animal figurine handmade from glass beads and wire in South Africa and Zimbabwe. Our life size fair trade beaded macaw figurine is 24 – 32″ tall (depending on how long the artisans decide to make the tail) and 8″ wide!! 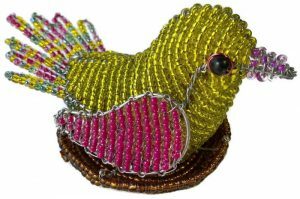 It’s painstakingly hand crafted by Africa’s best bead and wire artists in South Africa and Zimbabwe. A perfect parrot or pet lover gift! This gallery quality beaded macaw figurine makes perfect animal theme garden decor. Hang from a branch of your favorite tree or from the edge of the roof. Have you always dreamed of owning a magnificent macaw or parrot but don’t have the time, energy or budget for it? Well, our magnificent beaded macaw figurine requires no time or effort! Just hang him up in your kitchen, den or bedroom for maintenance free animal theme home decor!